We all love to cheer every time there’s a new study out showing the health benefits of chocolate, but it’s a lot less exciting the next week when another study comes out showing exactly the opposite. And just skipping from headline to headline doesn’t give you the background knowledge to even understand what’s going on in any of them. So here’s a Paleo rundown of the pros and cons of chocolate. The short answer: chocolate is healthy in its raw form; products made with chocolate generally aren’t. Cocoa butter: great source of healthy saturated fat. No problems here. Cocoa solids (that’s everything but the fat): contain a substantial amount of magnesium, tons of copper and zinc, and a very respectable dose of fiber. Cocoa solids also have a high antioxidant content. In this study, researchers found that the antioxidants in cocoa didn’t just reduce oxidative stress; they also had various cardiovascular health benefits (including blood pressure reduction and anti-inflammatory effects). Sounds pretty Paleo! Another term you might see on an ingredients label is “chocolate liquor” – this is just the name for cocoa butter + cocoa solids. It’s basically what you get when you grind cocoa beans and then melt them into a liquid. Despite the name, there’s no alcohol involved. So far, chocolate is looking pretty good for you. But there’s one last point to consider: phytic acid. Phytic acid is an antinutrient: it binds to minerals in a food and prevents you from absorbing them. Raw cocoa beans are high in phytic acid. But to make chocolate, the beans are first fermented, and then usually heat-processed as well, and both heating and fermentation destroy a lot of the phytic acid. Also, we typically eat only a little bit of cocoa powder at a time; it’s not like beans where you’d be basing your entire diet off a staple food rich in phytates. Ultimately, as long as you’re eating a reasonable amount of the stuff, there’s no need to worry about the phytic acid. Sugar: this is the big one. Most commercial chocolate bars have a huge dump of sugar added to the cocoa butter and cocoa solids. Milk: this may or may not be an issue for you personally, but it’s not great for everyone. Emulsifiers, stabilizers, preservatives, flavorings, soy lecithin…: some are harmless, but many are bad news. All the other stuff is what makes chocolate into a junk food – but fortunately, not all chocolate comes with so many unwanted extras. What’s the Best Kind of Chocolate? To get a Paleo-friendly chocolate, you’ll want to maximize the amount of actual cocoa bean products, while minimizing or eliminating all the other junk. Needless to say, this means picking a high-quality brand first and foremost. Real cocoa butter is expensive compared to additives and emulsifiers, so cheap brands use all kinds of extra tricks to cut down on the actual cocoa content as much as possible. To get the real thing, you’ll have to be willing to pay for a brand that cares about quality. 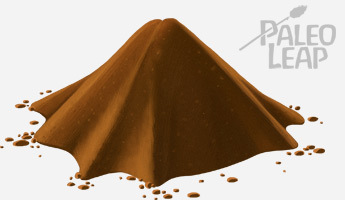 Unsweetened cocoa powder: this is just the cocoa solids. There’s none of that delicious and healthy cocoa butter in here, but there’s also no other monkey business, so it’s a very healthy ingredient to use in recipes or for homemade hot chocolate. Paleo approved! Unsweetened baking chocolate: this is some combination of cocoa solids and cocoa butter (the more cocoa solids, the darker the chocolate). After getting over their sweet tooth, some people find that baking chocolate tastes good when they just eat it straight; other people prefer to use it in recipes. Either way, this one also has no sugar, just the healthy parts of the cocoa bean. Paleo approved! *2 ounces is about the weight of 11 Hershey kisses; it’s quite a generous serving of chocolate. As you can see, a piece of high-quality dark chocolate has less sugar than some fruits! That’s really nothing to be afraid of, as long as you’re eating it as a treat rather than an everyday staple food. 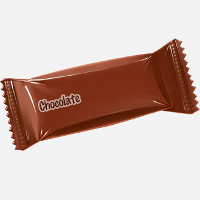 Milk chocolate: milk chocolate has cocoa solids, cocoa butter, milk, and sugar. The big difference is that while dark chocolate contains a very small amount of milk (if it has any at all), milk chocolate has quite a bit. The milk may or may not be an issue for you, depending on how well you tolerate dairy. But unfortunately, milk chocolate is also where you’ll find the cheap brands hiding, so be sure to watch the ingredients like a hawk. For the vast majority of people, dark chocolate is by far a healthier choice. Just to illustrate, here’s a table showing the sugar content of some common milk chocolates, compared to the same fruits as above. As you can see, now the chocolate is starting to outstrip the fruit in sugar content. And even the high-quality milk chocolate still has pretty much the same sugar count as the bargain-basement junk. If you’re going to eat milk chocolate, it’s still better to eat Lindt than Hershey’s because the high-quality stuff has fewer additives in it, but regardless of which you pick, milk chocolate has a substantial sugar load. White chocolate: white chocolate contains cocoa butter, sugar, and milk, but no cocoa solids. That’s why it has such a pale color. The lack of cocoa solids means that white chocolate doesn’t have the antioxidant potential of its darker cousins, but it still contains the healthy cocoa fat. If you can tolerate dairy, and if you can find a kind without a lot of sugar and goop thrown in, you’re getting a reasonably healthy treat with white chocolate, but those are two bit “if”s. Most of us only have access to cheap white chocolate, and remember the inescapable truth about cheap chocolate: you’re getting exactly what you pay for. You can eat Paleo without ever touching a bite of chocolate. But just like many other plant foods, the cocoa bean itself has powerful health-promoting properties: it’s a rich source of healthy fat and antioxidants, not to mention several important minerals. Fermenting these beans, roasting them, and eating the results fits perfectly well within the Paleo framework. And it doesn’t hurt that chocolate is so delicious. Yes, it’s an occasional treat and not a staple, but as luxuries go, it’s one of the best. Unfortunately, what doesn’t work so well in the Paleo context is the sugar count of most chocolate bars and candies. You can avoid a lot of the other junk just by picking a decent brand, but some sugar is pretty much unavoidable no matter where you go for your chocolate fix. For cooking, you can get around this using cocoa powder or baking chocolate, neither of which have any sugar added. And for eating, 80% dark chocolate or higher is generally fine; the sugar level in a reasonable serving is less than the sugar content of most servings of fruit, so there’s really nothing to get worked up about. Milk chocolate, on the other hand, can be off the table completely if dairy doesn’t sit well with you, and it also has quite a high sugar count. And white chocolate is great in theory, but in practice most white chocolate on the market is full of sugar as well. The bottom line: the darker the better. As you get used to not eating a bunch of sugar with everything, your taste buds will naturally lean towards darker chocolate anyway (the sweet stuff is just way too sweet). Test out some Paleo chocolate options with chocolate kiwi popsicles, coffee-flavored chocolate mousse, or even chocolate pudding to get that chocolate fix in a healthy, grain-free dessert.